Philippines has a lot of beauty to showcase for the world, which makes it unique compare to other countries around the world. In fact, four of the eye captivating places in the Philippines are nominated in one of the most prestigious list of beautiful places around the world, the new 7 wonders of nature. The Mayon Volacano in albay, Chocolate Hills in Bohol, Subterranean River National Park and Tubbataha Reef which are found in Palawan are competing to be included in the list of New 7 Wonders of Nature. 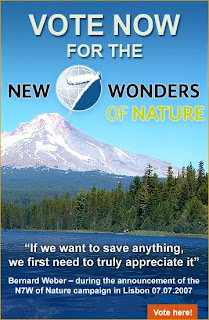 but how are we gonna help the Philppines?The answer is simple, you must visit the website of new 7 wonders of Nature to sign up and vote (Click here to Vote) for the nominies, so!please, everyone!we must Vote, and support the Philppines by voting!.Let's unite as one for the gold! sa pinas lang ba ito? or isasali nila sa 7 wonders of the world? or iba pa yon? oh yeahhh nakita ko yan sa PBB date. I wish manalo tayo! yep!! i heard about this!!! naka-vote na yata ako dati pa eh..
oh yay! i voted! go philippines! haha.